Diamonds aren’t the only white gemstone worth wearing. White sapphire and moissanite offer compelling alternatives to diamond jewelry. This post will explore some of the main differences between the two gemstones so you can choose what’s best for you. First, some brief descriptions of the two gemstones. White sapphires are actually from the corundum mineral group, the same material as blue sapphires and rubies. The only difference between the above gemstones and the white sapphire is the trace element. If there is a trace of chromium in the gemstone, it turns ruby red, while traces of iron and titanium make the sapphire blue. White sapphires are free of any trace elements, creating a clear and colorless gem. Here’s an example of a white sapphire on one of our most elegant engagement rings, the Rosados Box Gallina 4.5mm & Petite Bubbles 14kt (note the center stone is white sapphire, the band gemstones are diamond). Originally found in a meteor crater, moissanite is silicon carbide, a crystalline that has now been synthesized in labs for the past hundred years. 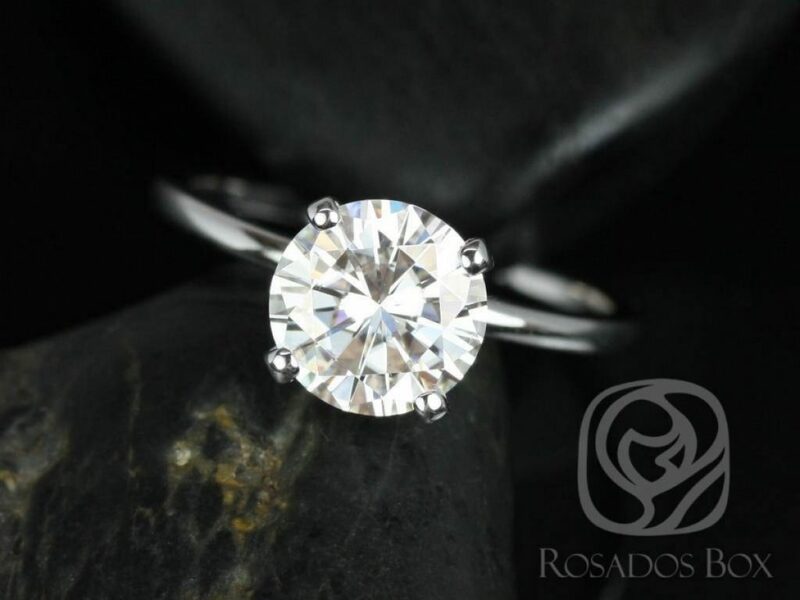 Moissanite has high ratings on the hardness and clarity scale, similar to the diamond, but is more affordable. All these points are reasons why this gem has become so popular for wedding and engagement rings. Read more about moissanite here. Check out the Rosados Box Sandra 8mm 14kt White Gold Round F1 for a memorable engagement ring with a moissanite center stone. What’s the difference between white sapphire and moissanite? Both gemstones are clear white, have strong durability, and are popular in modern rings. So what sets them apart? 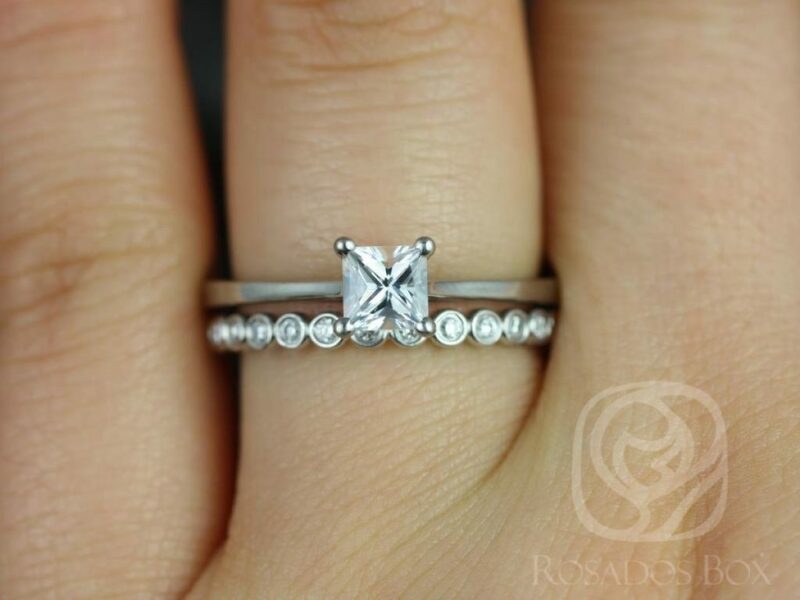 Although diamond remains the hardest element, you can’t go wrong with either white sapphire and moissanite. Both gems rate highly on the Mohs Hardness Scale, with sapphire scoring a 9.0, and moissanite scoring slightly higher with a 9.5. Over time, however, you may want to be a little more careful with white sapphire jewelry, as white sapphires (particularly the edges) tend to wear more easily over the years. Both gems generally appear colorless, although impurities may lead to slight discoloration (a slight yellow tinge on white sapphires). In terms of clarity, moissanite may appear clearer than white sapphire- sapphire tends to scratch and attract dirt more frequently than moissanite, so keep in mind you’ll have to do some more cleaning to retain its appearance. In terms of overall sparkle, moissanite may also have a slight edge. Moissanite has a much higher Brilliance Refraction Index (2.65-2.69 compared sapphire’s 1.77) and fire (0.104 compared to sapphire’s 0.018). Some people have noted that moissanite’s fire can be too much- resulting in a rainbow/disco ball flash. 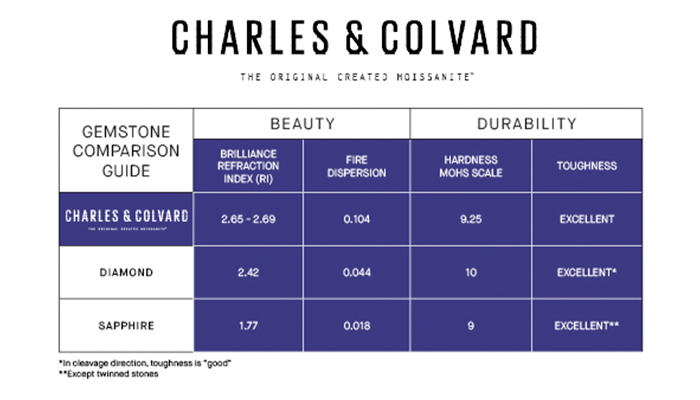 Chart from Charles & Colvard, the original creators of moissanite. Both white sapphire and moissanite offer cost-effective alternatives to the diamond gemstone and fine jewelry, which explains their surges in popularity. If you want to choose the more affordable gem between the two, the white sapphire will be the more budget-friendly option when it’s approximately 1.50cts and under, as the natural sapphire gets larger in size, the price per carat starts to add up due to rarity. 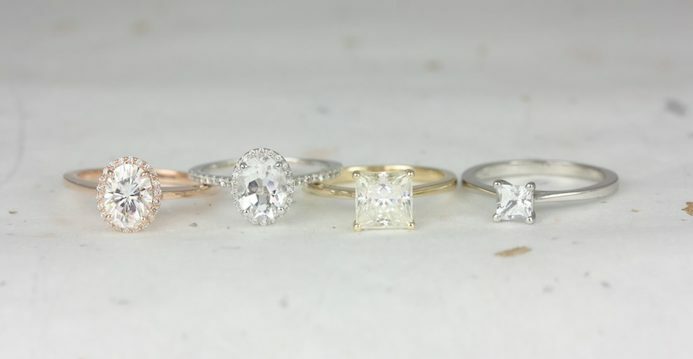 Is moissanite better than white sapphire? In terms of durability and appearance, moissanite is preferred over white sapphire. In terms of affordability, however, white sapphire is the better option. Ultimately, the choice is based on personal preference. Whichever gemstone you choose will be a valuable alternative to diamond, and will look stunning on your ring of choice. Explore our elegant selections of engagement and wedding rings. « What Do Diamonds Symbolize?